Proud to be serving the Heating Ventilation and Air Conditioning needs of our clients since 1974. Showing support for Movember with their amazing mustaches, Glenn Gracie our Superintendent and our Estimating Department Rich West and Jeff Windhorst. 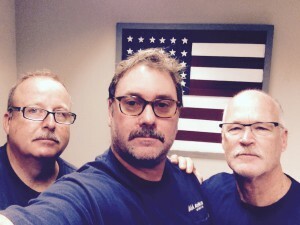 These guys are supporting a great cause, they are growing these spectacular Dr. Phil mustaches to support men’s health awareness, they even have a little donation jar in their office. What does it mean to have your new experienced modification rate down 65% to last years 72%? 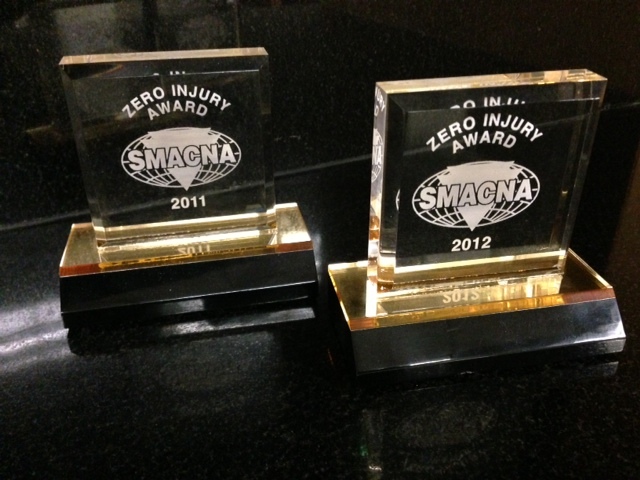 It means for two years in a row AireMasters has also been honored not only with zero injury award by CAL SMACNA but also Safety Awards for 2011 and 2012 for AireMasters outstanding safety records. Effective July 2013 AireMasters will have their new experienced modification rate, down 65% to last year’s 72% which was already excellent. This is one of the lowest MODS in CAL-SMACNA. 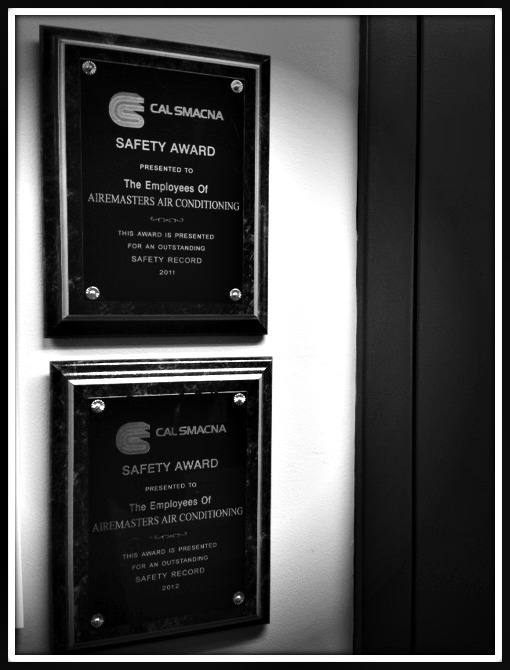 AireMasters takes pride in our safety excellence and strives to keep a great rate. AireMasters has a skilled in house safety committee which holds quarterly meetings. These meetings include any new laws or ideas which help to keep our injury incidents low to none and improve our on-site safety. In the field we hold weekly on-site tailgate meetings going over the week’s events and keeping organized binders on our safety meeting minutes. Each week per job site our Personnel Department includes Tool Box Topics to review at the weekly meetings. Always striving to stay aware of the possible hazards around job sites. Being preventative in our measures has achieved AireMasters their continued success with recognition from CAL-SMACNA and low insurance mod rates. Safety saves lives and increases job efficiency. 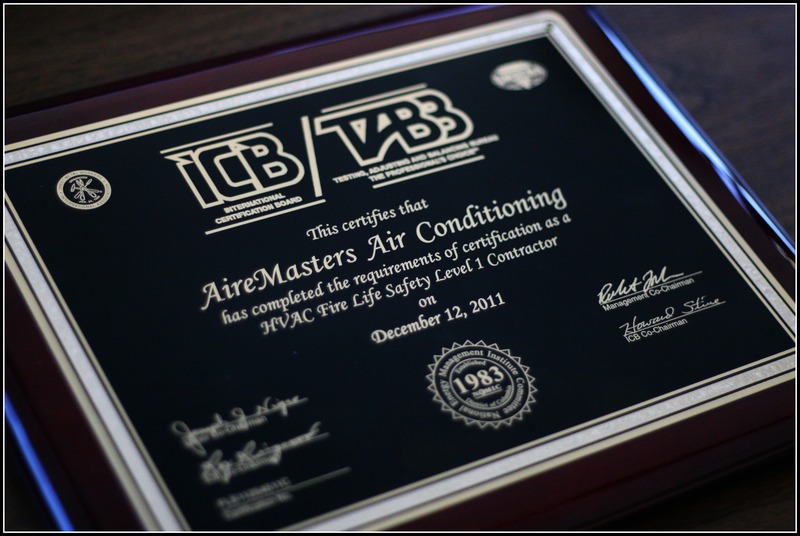 AireMasters Air Conditioning is now a HVAC Certified Fire Life Safety Contractor! AMAC can do Fire Damper and Fire Smoke Damper Inspections on your building! Cycle Test (open and closed) all motorized fire and smoke dampers. Test all dedicated smoke-control systems. Visually inspect all fire dampers, ceiling radiation dampers, smoke dampers, and combination fire smoke dampers. Manually operate (open and close) all fusible link operated fire dampers and ceiling radiation dampers. AMAC is qualified and ready to inspect and certify the dampers in your building. Just give us a call for details..
©2019 AireMasters Air Conditioning, Inc. All rights reserved.